Shawn Flaherty has over 25 years experience helping both small and large businesses. From basic company formation, to contracts and transactions, employee issues and complex litigation, the attorneys of Flaherty Fardo are experienced in all aspects of business law and litigation. We know that Pennsylvania businesses need to balance negotiation skills with the ability to litigate. We help our business clients avoid lawsuits, and if we cannot avoid them, then we are prepared and skilled at litigating them. Our Pittsburgh litigation attorneys are experienced negotiators, mediators and trial lawyers. We try to avoid business law suits and disputes if at all possible. However, our experience has shown that in order to be successful in negotiations, it is important to operate from a position of strength. That often means filing suit. We believe that one of the various advantages that we offer to small and medium sized businesses is large firm quality representation without large firm legal fees. When clients are only concerned with their legal bills, they are often quick to want to settle, and as a result, may lose bargaining power that they otherwise may have. We are able to ease these worries by valuing each case and business differently, and providing clients with a fee structure that allows them to focus on the merits of their case, not their legal bills. Our attorneys are always prepared to go to trial. If the opposing party realizes that we are prepared to go to trial and that we will spend whatever time and money is necessary to prevail, then through a position of strength we are able to negotiate the best settlements and outcomes for our clients. We keep all options open at all times, because that is what smart business litigation attorneys should do. We remain focused on our client’s goals without any other issues clouding those objectives. Our partners Shawn T. Flaherty, Esq. and Noah Paul Fardo, Esq. have extensive experience in helping small, medium and large corporate businesses. 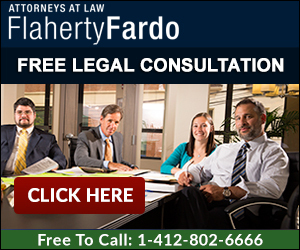 Call the business litigation attorneys of Flaherty Fardo for a free consultation at 412.802.6666. Our Pittsburgh firm enjoys collecting monies for our clients. Our clients consist of banks, credit unions, business owners, collection agencies, mortgage companies and individuals. We thoroughly research and analyze every collection case before we accept it. Over the past 10 years, our team of collection attorneys have helped creditors recover monies and debts owed for student loans, defaulted mortgages, and everyday account receivables including money loaned. We have helped our business clients engage in pre-litigation, litigation and post-litigation strategies, including sending demand letters, filing suit and obtaining a judgment, repossession, seizure of bank accounts and sheriff’s sales of personal and business property. There are times for filing suit in collections and there are times when it is more advantageous to negotiate. We help our clients make the best overall business decisions to collect their money fast. A contract is simply the legal understanding between two parties. A contract helps explain the rights and legal obligations of each party and typically provides legal remedies should either party default on the contract. Contracts help avoid confusion and misunderstandings. In certain situations (i.e. the sale of a property) the law (Statute of Frauds) mandates that the agreement must be in writing. We have extensive experience in reviewing a wide arrange of legal contracts and documents. We routinely advise physicians, professionals, and many of our business clients on a variety of contract issues, including employment agreements, service agreements, real estate agreements, leases, non-compete agreements, and everyday business documents. The key to reviewing contracts is to prevent litigation if possible. In a worst case scenario, we make sure that our clients are protected should litigation be necessary. Read about: Pennsylvania Contract Law. One exception is the existence of a written contract. Unless there is a written employment contract between the parties, Pennsylvania workers have very few rights. If an employer does not like the sound of your voice, or your clothing, or has a personality conflict with you, and you are an at-will employee, then most likely you can be fired immediately without legal redress. Our employment attorneys understand Pennsylvania employment law with regards to both the hiring and terminating process. By obtaining proper employment advice with regards to employees, businesses can better avoid legal disputes and save money. If you or your business have questions about Pennsylvania business law, rely on the cost-effective, experienced business litigation attorneys of Flaherty Fardo for a free consultation at 412.802.6666.